We have increased our range of the finest Japanese Aloeswood sticks from Nippon Kodo, with the addition of 3 items from the Kyara Taikan range. Kyara Taikan sticks are created from a blend of finest Aloeswood, Herbs and Spices. Kyara is the name used for the finest Aloeswood, sourced from Vietnam and surrounds. This is an ever decreasing and difficult to find and has become more expensive than gold by weight. Taikan translates as 'Great Prospects' - so together this item name translates as 'Great Prospects Kyara'. This item is at the top end of Nippon Kodo's Japanese Incense production, so is very special. That's 10 items from Nippon Kodo, each with either a different twist on the Aloeswood fragrance and/or choice in stick length and count per box. There's also a range of pricing here from £3.75 to £97.99, which should offer something for everyone interested in high-quality Japanese Aloeswood fragrances. 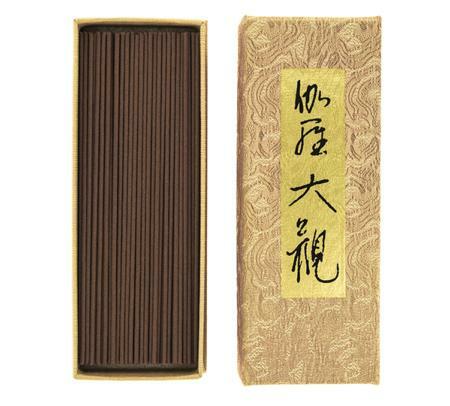 For even more high-quality Japanese Incense from Nippon Kodo view the Superior Incense category in our Online Incense Shop here.